My passion for helping people live and relate authentically came out of my own experience. In my 20s I had a successful career in the BBC (see below) and a busy social life but when my only brother suddenly died when I was 21, I realised that my friendships weren’t as strong or as deep as I had hoped. Part of the problem stemmed from my years at boarding school (I went at eight years old). During my years away from home I learned to become very self-sufficient, capable, independent and driven. I also taught myself not to express negative emotions. The result was that I was not geared up for intimate connections. I was living life in black and white but not in colour. Over the next 24 years my mess became my message and I have been discovering what it means to live and relate authentically. It is a journey that still continues and one that I am sure will last my lifetime. I started as a graduate BBC News Trainee. I worked for for seven years as an on-screen reporter and correspondent on TV programmes such as Business Breakfast, Working Lunch and Breakfast News. It wasn’t all serious news… in fact with colleagues like these two below, it was often a lot of fun. In 2001 I made the move into relationships education. I helped develop The Marriage Course and The Marriage Preparation Course, which are now run in thousands of venues worldwide. 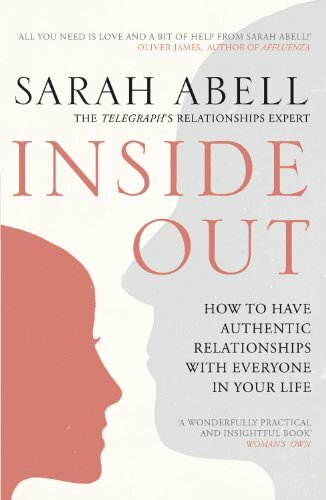 I became self-employed in October 2008 and was commissioned by Hodder & Stoughton to write my book Inside Out – how to have authentic relationships with everyone in your life. In 2010 I became the Agony Aunt for The Daily Telegraph, with my own weekly column in the paper and online. I now write a monthly column for Psychologies magazine. I currently work as a Transformative Coach, helping individuals and organisations to relate authentically and live wholeheartedly. I also coach couples with my husband David. I am a regular speaker on relationships. I spoke at TEDx Bristol on failure to relate authentically and TEDxYouth Manchester on authentic connections. I have also recently presented a live workshop event for Psychologies magazine. I met my husband David on a counselling course and we have been married ten years. We have one son, Jed, and currently live in Bristol. If you enjoy embarrassing stories you might enjoy reading mine about how David and I got together. Inside Out: How to Have Authentic Relationships with Everyone in Your Life.